Observations of individual comets are given below, in ICQ format. Jeff Larsen discovered a 17th magnitude comet on images taken with the 0.91-m Spacewatch telescope at Kitt Peak on 1997 November 3.2. [IAUC 6767, 1997 November 3]. It is a distant, periodic comet of the Jupiter family with a period of 11 years and made a close encounter to within 0.33 AU of the planet in February 1995. J. V. Scotti recovered comet P/1997 V1 (Larsen) with the Spacewatch 1.8-m f/2.7 reflector at Kitt Peak on June 9.44. The indicated correction to the prediction on MPC 54170 is Delta T = -2.0 days. This is the 200th comet to be numbered, although several SOHO comets have been observed to return and not numbered. Improved orbital elements were published on MPEC 2001-S05, including prediscovery observations on Aug. 19 by LINEAR by B. G. Marsden and these indicate that this comet passed only 0.014 AU from Mars on 2002 Jan. 10.7 TT, as first suggested by C.-I. Lagerkvist (Uppsala) and G. Hahn (German Aerospace Center, Berlin). [IAUC 7720, 2001 September 19] The comet has a period of 6.5 years and was at perihelion on 2002 February 17. Comet 2001 R1 (P/LONEOS) was recovered by Michael Jaeger from Stixendorf, Austria on August 31.09 as a 17th magnitude object. It was confirmed by Giovanni Sostero and team from the Skylive Observatory, Catania, Italy the following night. The comet is a month past perihelion and will fade. Following posting of the recovery on the comet-ml Maik Meyer located NEAT images on frames from 2001 August. The indicated correction to the prediction on MPC 54169 is Delta T = -0.42 day. J. V. Scotti, Lunar and Planetary Laboratory, reported his discovery of a 19th mag comet on CCD images taken with the 0.9-m Spacewatch telescope on 2001 December 14.44, noting a coma diameter of 5" and a tail 0'.40 long in p.a. 283 deg (and m_2 = 22.7). Confirming observations were made at Klet by J. Ticha, M. Tichy, and P. Jelinek, who reported a 8" coma and a faint westward tail. [IAUC 7775, 2001 December 14]. The latest orbit shows that the comet is of short period (7.3 years), with perihelion at 2.5 AU in 2001 October. 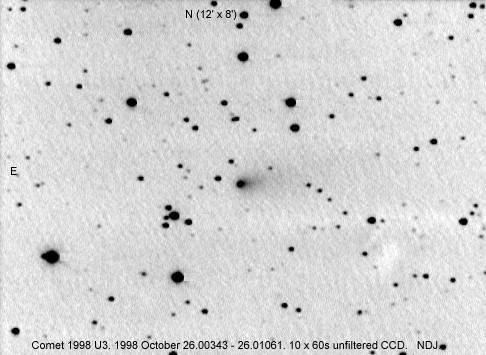 Jim Scotti recovered his comet (P/2001 X2) on Spacewatch images taken with the 1.8-m reflector at Kitt Peak on 2008 September 5.43 as a 21st magnitude object. The indicated correction to the prediction on MPC 56802 is Delta(T) = -0.15 day. Pre-recovery images were found on Mt Lemmon frames from 2007 September and October, and Spacewatch from 2008 August. The comet passed 0.67 AU from Jupiter on 1960 March 24. An orbit by Syuichi Nakano links the comet with asteroid 1929 WW. Gareth Williams identified images of 1999 WJ7 in incidental astrometry taken with the 0.9-m Spacewatch telescope on September 3.24. The comet was 20th magnitude, with perihelion in 2010 February. The indicated correction to the prediction on MPC 59598 is Delta(T) = -0.3 day. An 18th mag object independently discovered and reported as nebulous with a 3" coma by NEAT at Palomar on Nov. 16.53 UT was identified by G. V. Williams, Minor Planet Center, with an apparently asteroidal object reported on Oct. 13.44 and 17 by LINEAR (m_2 = 19.8; discovery observations on MPS 39482) and on Oct. 19 by NEAT at Haleakala (MPS 40840), from which an apparently routine minor-planet orbit was computed (MPEC 2001-V35). Following posting on the NEO Confirmation Page, P. Kusnirak at Ondrejov found the comet to be moderately condensed with a 0'.3 coma on CCD images taken on Nov. 17.2 with a 0.65-m f/3.6 reflector. [IAUC 7753, 2001 November 17] The comet is in a short period orbit of 7.2 years, with perihelion of 1.94 AU in mid December 2001. Gareth Williams identified images of 2001 TU80 in incidental astrometry taken with the 1.8-m Spacewatch telescope on September 8.43. The comet is at perihelion in December. The indicated correction to the prediction on MPC 54171 is Delta(T) = -0.3 day. This was Giacobini's first of 12 comets, discovered from Nice on 1896 September 4, and observed for 17 weeks until 1897 January 5, although it wasn't a particularly favourable apparition. This gave it a relatively well determined orbit, but it wasn't recovered at the next apparition, which was similar to the discovery one, nor at subsequent more favourable returns. It has made several approaches to Jupiter, but these have not changed the orbit substantially. Koichi Itagaki (Teppo-cho, Yamagata) and Hiroshi Kaneda (Minami-ku, Sapporo) discovered a 13th magnitude comet on unfiltered CCD patrol frames taken on September 10.56 UT using a 0.21-m f/3 reflector. A confirming unfiltered CCD image was taken subsequently with a 0.60-m f/5.7 reflector at Yamagata, where the comet was diffuse with strong condensation, with a coma diameter of about 25" and a 2' tail toward the east-southeast. Maik Meyer, Limburg, Germany, suggested that the comet was identical to comet 1896 R2 (D/Giacobini), which had not been seen since January 1897 and for which a prediction by Nakano gave T = 2008 September 9.89. This prediction was included in the BAA listing for the comets expected in 2008. Richard Buckley made a prediction for its return in 1975, which was published in the Journal in 1977. The identity has been confirmed by Nakano, who notes that the comet has made 17 revolutions and passed only 0.51 AU from the earth on 1962 September 9 and 0.81 AU from Jupiter on 1992 January 14. The linked orbit shows that the comet was at perihelion on September 10.21. It also suggests that Buckley's prediction was out by roughly six days. The fact that the comet was not recovered on previous occasions, and that it is now past its brightest for this return, suggests that the comet might have been found in outburst, although it was expected to reach 11th magnitude based on the discovery apparition. Further confirmation of this suggestion was made when D. T. Durig and K. N. Hatchett, Cordell-Lorenz Observatory, Sewanee, Tennassee, USA reported observations of two additional components, which have perihelion times differing by Delta(T) = +0.014 and +0.133 day. Zdenek Sekanina suggests that the two fragments separated from the parent some time ago. The one closest to the parent (B), separated in the second half of 2006, around 700 days before perihelion. Fragment C separated at the end of 1998, three years before the last return to perihelion. In both cases the comet was over 4.5 AU from the Sun at the time. Andrea Boattini discovered a 17th magnitude comet in a dense part of the Milky Way during the course of the Catalina Sky Survey with the 0.68-m Schmidt on October 7.22. Maik Meyer suggested an identity with D/1892 T1 (Barnard) and Gareth Williams then re-reduced the published observations. Williams and Nakano then computed a linked orbit which shows that the comet made 20 revolutions between 1892 and 2008, passing about 0.3-0.4 AU of Jupiter in 1922 October, 1934 August, and 2005 August. The comet is at perihelion at 1.15 AU in late October and has a period of 5.8 years. The comet was the first one to be discovered photographically, by E E Barnard from the Mount Wilson Observatory on 1892 October 12. It was very faint and only followed until December 8. The apparition was not a particularly favourable one and the comet was last observed a few days before perihelion. The calculated orbit suggested that no favourable returns were likely for some years and the comet was lost. Richard Buckley published a paper on missing comets in the BAA Journal in 1977 (BAAJ, 87, No3) and gave a prediction for a return in 1976. Ken-ichi Kadota, Ageo, Saitama-ken, Japan recovered comet 2001 J1 (P/NEAT) on CCD images obtained with his 0.25-m f/6 reflector on October 15.78. Confirming observations were also made by H. Abe (Yatsuka-cho, Shimane-ken, Japan, 0.26-m reflector). The indicated correction to the prediction on MPC 54170 is Delta(T) = -0.6 day. Robert McMillan discovered a 19th magnitude comet with the Spacewatch 1.8-m reflector on October 19.20. Further prediscovery images back to September 20 were found in Spacewatch imagery. The comet has a period of 8.1 years and was at perihelion at 2.5 AU in mid May. In 2008 December, S Nakano linked the comet with previously unreported observations of an 18th magnitude object obtained by LONEOS in September and October 2000. This return is now designated 2000 S7. The new orbit shows that the comet passed 0.18 AU from Jupiter on 2004 July 8. The comet is one of those suspected to have undergone nuclear splitting according to the list of Marcos & Marcos [Dynamically correlated minor bodies in the outer solar system, MNRAS, 474, 838, 2018 February]. They link it to 2011 Q3 (P/McNaught). 209P/LINEAR = 2004 CB = 2008 X2 An apparently asteroidal object of 18th magnitude discovered by LINEAR on February 3.40 turned out to show a tail. The orbit has a period of 5.03 years and a perihelion distance of 0.91 AU and it reached this point on 2004 April 2. Gary Hug recovered 2004 CB (P/LINEAR) on 2008 December 4.39 as an essentially stellar object of 20th magnitude. The indicated correction to the prediction on MPC 56803 is Delta(T) = +0.16 day. A paper to be published in Icarus http://arxiv.org/abs/1509.00560 suggests that it is an aged comet that has been in its present orbit for around 10,000 years and is now only weakly active. The nucleus is reddish, similar to D type and Trojan asteroids. The comet may have been briefly more active in the 18th century. 210P/Christensen = 2003 K2 = 2008 X4 An object discovered by the Catalina sky survey on 2003 May 26.18 was quickly confirmed as cometary. It passed perihelion at 0.55 AU in April, but is intrinsically faint. It was visible on SWAN imagery and at brightest probably reached 10th magnitude; it seems likely that it was the object reported in SWAN imagery between April 5 to 19, but which was not confirmed visually due to low elevation and poor elongation from the Sun. It faded from 14th magnitude. Its elongation remained relatively small and it was not favourably placed for observation. As astrometric observation accumulated there was increasing evidence that it was a short period comet, with a period between 12 and 17 years and perihelion distance around 0.6 AU. These indications from orbits by Muraoka and others were confirmed on IAUC 8145 [2003 June 7] which gave an orbit with period of 6.5 years. Further orbit computations by Muraoka, Stoss and others using data up to June 15 have revised the orbit, and there are no significant changes to the orbit at the next return. The period is still uncertain by 1.5 months. An orbit by Marsden published on MPEC 2003-M70 [2003 June 30] gives P as 5.75 years and q at 0.55 AU. Attempts at recovery by Maik Meyer in November 2008 were unsuccessful, with the comet not being found down to 18th mag along the line of variation +/- 9 days. Alan Watson found a 10th magnitude comet on SECCHI HI1-B images taken on December 8.24 Rainer Kracht made measurements of the object's position and computed a parabolic orbit, from which Maik Meyer suggested identity with comet P/2003 K2. The indicated correction to the prediction on MPC 56802 is Delta(T) = -22 days. Rob Matson reports that the comet was visible in SWAN imagery from December 4, but was moving slowly in a location close to the occulting region. If anyone took an image of the planetary conjunction of Venus and Jupiter in early December it is just possible that they might have captured the comet, although for UK observers it would be very close to the horizon. The comet passed through the SOHO LASCO C3 field between December 20 and 26, but at 9th magnitude would probably not have been detectable. However Piotr Guzik pointed out that the geometry is strongly forward scattering and the magnitude could be enhanced by 5 - 6 magnitudes around December 23. Joe Marcus suggested that the forward scattering could be sufficiently strong to enhance the brightness by as much as 6.5 magnitudes, making it a prominent object in the SOHO fields. On December 21.8 it was easily visible in the C3 field at about 8.2, along with two Kreutz comets. The comet emerged into the morning sky in January. Few observations have been made, but it appears to be fading relatively slowly. 5 observations give an uncorrected preliminary light curve of m = 9.4 + 5 log d +  log r.
Rik Hill discovered a 17th magnitude comet on CCD images taken with the 0.68-m Catalina Schmidt telescope on December 4.34. The comet reaches perihelion at 1.6 in May 2009. Calculations by Hirohisa Sato allow for the possibility of an elliptic orbit of period 11 years and perihelion at 2.0 AU in early June 2009. This was confirmed by subsequent orbits, which give a period of 6.7 years and perihelion 2.4 AU in 2009 May. With an improved orbit, Maik Meyer subsequently found previously unidentified images of the comet on frames taken by NEAT on 2003 March 24 and LONEOS on 2003 April 1. The comet was given the designation 2003 F6 at this return, which had perihelion on 2002 August 19.1. The comet suffered a minor encounter with Jupiter in 1925, but the orbit has been stable since then. It approaches Jupiter to 0.38 au in 2032 August, which will increase the perihelion distance from 2.3 to 2.7 au. 212P/NEAT = 2000 YN30 Originally identified as an unusual asteroid this object has a perihelion distance of 1.65 AU and a period of 7.8 years. It was at perihelion in early December 2008. [MPEC 2008-V41, 2008 November 7] It can pass within 0.4 AU of Jupiter. Observations in early January 2009 showed a coma, and so with observations over two returns and a secure orbit it was numbered 212. M E Van Ness noted a 17th magnitude cometary object on LONEOS images taken on September 10.41. It was in a short period orbit of 6.3 years and was at perihelion at 2.13 AU in 2005 February. It brightened to visual range in October, but then faded, so this was clearly a temporary outburst. It is unlikely to become brighter than 19th magnitude at the next return. Comet 2005 R2 (P/Van Ness) was recovered by Gary Hug with his 0.56-m reflector at Sandlot Observatory on January 31.36. It was 21st magnitude. The indicated correction to the prediction on MPC 62889 is Delta(T) = -0.1 day. It became brighter than expected in 2011 and a secondary condensation was observed by Giovanni Sostero, Nick Howes, Helen Blyth and Ernesto Guido in images taken with the Haleakala-Faulkes Telescope North on August 5.5, and subsequently seen in images by J. Gonzalez at the end of July and early August. Orbital calculations by Hirohisa Sato suggest that the split occurred in 2007 or 2008. Following an alert from a Japanese observatory, the team observed an additional component in September. The continued fragmentation may explain why the comet has remained brighter than expected. A 20th magnitude object, discovered by LINEAR on February 7.47 was found to have a coma. It was near perihelion at 1.84 AU and has a period of 6.8 years. It is a Jupiter family comet. An object reported as asteroidal by LINEAR (discovery observation below), given the designation 2002 CW_134 on MPS 50314, and later placed on the NEO Confirmation Page, has been found to show cometary activity: Mar. 19.0 UT, diffuse with coma diameter 13" (M. Tichy and M. Kocer, Klet, 1.06-m reflector); Mar. 23.0, diffuse, faint coma extended about 30" in p.a. 330 deg (G. Masi and F. Mallia, Campo Catino, Italy, 0.8-m reflector). Comet 2002 CW134 (P/LINEAR) was also recovered by Gary Hug with his 0.56-m reflector at Sandlot Observatory on January 31.49. It was 20th magnitude. The indicated correction to the prediction on MPC 56802 is Delta(T) = -0.32 day. It is in a periodic orbit of 8.1 years and perihelion at 3.2 AU and is a Jupiter family comet. Comet 2002 O8 (P/NEAT) was also recovered by Gary Hug with his 0.56-m reflector at Sandlot Observatory, on January 22.49. The comet was 20th magnitude. The indicated correction to the prediction on MPC 59599 is Delta(T) = -0.34 day. Comet 2001 CV8 (P/LINEAR) was recovered by Jim Scotti with the Spacewatch 1.8-m reflector on 2009 February 19.53. The indicated correction to the prediction on MPC 54170 is Delta(T) = -0.37 day. 217P/LINEAR = 2001 MD7 = 2009 F3 N. Blythe, Lincoln Laboratory Experimental Test System, reports the discovery by LINEAR of an 17th mag comet on images obtained on 2001 July 11.22, when it appeared diffuse. Subsequent observations permitted identification with the object 2001 MD_7, so designated on MPS 31852 as a result of LINEAR observations made on June 21.31 and 24. L. Sarounova reports that CCD images of the comet obtained on July 12.9 UT at Ondrejov show a bright nucleus and faint coma. [IAUC 7660, 2001 July 12] This was LINEARs 65th comet. The comet was recovered by Ernesto Guido, Giovanni Sostero and Paul Cammileri on 2009 March 17.50 using remote telescopes in the USA (the RAS Observatory 0.25-m reflector near Mayhill, NM) and in Australia (the 0.35-m reflector at Grove Creek Observatory, Trunkey, N.S.W.). The comet was 18th magnitude. The indicated correction to the predictions on MPC 56804 is Delta(T) = +0.01 day. It is a reasonably favourable return and the comet could reach 12th magnitude near the time of perihelion, coming into view for UK observers in August. This comet was discovered by LINEAR on April 29.33. It was near perihelion at 1.70 AU and around 18th magnitude. The period is 6.1 years. The comet approached within 0.46 AU of Jupiter in December 2000 and approached the planet even closer at some previous returns. An encounter to within 0.02 AU in April 2012 will reduce the perihelion distance to 1.17 AU, though the subsequent two apparitions are not particularly favourable. On March 31 the LINEAR team reported a possible recovery of comet 2003 H4 (P/LINEAR) and this was confirmed by Giovanni Sostero, E Propsperi, Ernesto Guido and Paul Cammileri on April 15 using a remote telescope in Australia (the 0.35-m reflector at Grove Creek Observatory, Trunkey, N.S.W.). The comet was 20th magnitude. The indicated correction to the predictions on MPC 56804 is Delta(T) = -0.13 day. 219P/LINEAR = 2002 LZ11 = 2009 H1 An 18th magnitude asteroid discovered by LINEAR on 2002 June 5.30 was found to show a coma on images obtained on 2003 October 29 by the Catalina Sky Survey on 2003 November 17. It is in a 6.99 year orbit, with perihelion at 2.37 AU and an eccentricity of 0.35. Perihelion was in mid March 2003. The object is presumably in outburst as the indicated ephemeris would have made it 17th magnitude in 2002 and it was not found to be cometary by any surveys. Ernesto Guido, Giovanni Sostero, Paul Cammileri and E Propsperi recovered comet 2002 LZ11 (P/LINEAR) on April 17.45 using a remote telescope in the USA (a 0.25-m reflector near Mayhill, New Mexico). The comet was 19th magnitude. The indicated correction to the predictions on MPC 59599 is Delta(T) = -0.4 day. Rob McNaught discovered a faint comet on CCD images taken with the 0.5-m Uppsala Schmidt at Siding Spring on May 20.80 during patrols for the Siding Spring Survey, the southern counterpart of the Catalina Sky Survey. SSS is jointly operated by the University of Arizona and the Australian National University, with funding from NASA. The comet is periodic, with a period of 5.5 years. It reached perihelion at 1.55 AU in mid June 2004. Automatic analysis of data from 2009 April 28 provided to the Minor Planet Centre by Spacewatch identified comet P/2004 K2 (McNaught). The comet was also independently recovered by Gustavo Muler, J. M. Ruiz and Ramon Naves with the 0.30-m Schmidt-Cassegrain at the Observatorio Nazaret (Lanzarate, Spain) on May 1 and 3. The indicated correction to the prediction on MPC 56805 is Delta(T) = -0.08 day. The images from April 28 were stellar with no trace of coma or tail. Perihelion is at 1.8 AU and the object is in a 6.6 year periodic orbit. It is a Jupiter family comet. Leonid Elenin, Lyubertsy, Moscow region, Russia, recovered comet P/2002 JN16 as part of the ROCOT project. On June 1.40, he detected a diffuse object (~20.2m) with a small tail on 16 images obtained on 0.36-m f/3.8 Maksutov-Newtonian + ST-10XME (Tzec Maun observatory, Mayhill, NM, USA). The next day he requested confirmation of the recovery, and Michael Schwartz at Tenagra observatory imaged the comet on June 3 with 0.81-m f/7 Ritchey-Chretien + SITe. These images clearly show a tail at PA 248 degrees and length about 35". The correction to the predictions on MPC 56802 is Delta(T) = -0.2 day. 222P/LINEAR = 2004 X1 = 2009 MB9 LINEAR reported the discovery of an apparent 19th mag comet with tail on 2004 December 7.08, which was confirmed by other observers. The available astrometry showed a low inclination orbit with perihelion at 0.78 AU in early November. This was subsequently confirmed as being of short period, with periodicity 4.9 years. Rob McNaught discovered an 18th magnitude asteroid on images taken during the Siding Spring Survey with the 0.5-m Uppsala Schmidt on June 29.47. On a subsequent observing run on August 2.38 he noted that the object appeared cometary. Hirohiso Sato pointed out that the object appears to be comet P/LINEAR (2004 X1); the indicated correction to the prediction on MPEC 56804 being Delta_T = -2.2 days. The comet has a period of 4.83 years and reaches perihelion at 0.78 AU on September 1.1. B. Skiff, Lowell Observatory, reports his discovery of a comet on images taken by him in the course of the LONEOS program, on September 17.42 at mag 18.0. The object has a moderately condensed coma of diameter 10" and a tail 30" long in p.a. 285 deg. At Skiff's request, M. Hayes-Gehrke obtained a confirming 5-min CCD R frame (also on Sept. 17, in twilight) with the Lowell Observatory's Perkins 1.8-m telescope, showing a 8" coma and a tail about 30" long in p.a. 280 or 285 deg. [IAUC 7972, 2002 September 17] Further observations showed that it was periodic, with an 8.3 year period and perihelion distance of 2.31 AU in late March. G. Sostero, E. Guido, P. Camilleri and E. Prosperi recovered P/Skiff (2002 S1) on June 15.61 from the co-addition of forty unfiltered 60-s CCD exposures obtained remotely on June 15.6 UT with the 0.35-m f/7 reflector at the Skylive-Grove Creek Observatory (near Trunkey, NSW, Australia). The recovery was confirmed by them on August 18.58. The comet was 20th magnitude and of stellar appearance. The indicated correction to the predictions on MPC 59600 is Delta(T) = -0.16 day. LINEAR discovered an 19th mag asteroid on December 4.34. NEAT independently discovered the object on December 14.43 and reported it as cometary. It was posted on the NEO confirmation page on cometary activity was noted by Peter Birtwhistle amongst others. Prediscovery images were made by LINEAR on November 20. The preliminary elliptic orbit of 6.1 years puts it at perihelion in mid September at 1.88 AU. Jim Scotti recovered 2003 XD10 (P/LINEAR-NEAT) with the Spacewatch 1.8-m f/2.7 reflector at Kitt Peak on August 27.39. The comet was 21st magnitude and of stellar appearance. The indicated correction to the prediction on MPC 59598 is Delta(T) = -0.10 day. The comet was periodic and was near perihelion. The period is around 6.7 years and the perihelion distance 1.2 AU. BAA Member Peter Birtwhistle was amongst the first to confirm its cometary nature. Jim Scotti recovered 2002 T1 (P/LINEAR) with the Spacewatch 1.8-m f/2.7 reflector at Kitt Peak on August 28.49. The comet was 21st magnitude and of near-stellar ("soft") appearance. The indicated correction to the prediction on MPC 56804 is Delta(T) = +0.04 day. 226P/Pigott-LINEAR-Kowalski = 1783 W1 = 2003 A1 = 2009 R2 LINEAR discovered a 19th mag comet on 2003 January 5.07. [IAUC 8044, 2003 January 8] Although parabolic orbital elements were published, Brian Marsden noted on MPEC 2003-A56 [2003 January 8] that the object was probably of short period, and that its orbit was rather similar to that of comet D/1783 W1 (Pigott). Further observations, published on MPEC 2003-A86 [2003 January 15] confirm the short period nature of the orbit, with perihelion at 1.91 AU, a high inclination of 46 degrees and a period of 7.1 years. This was LINEAR's 100th comet. If the comet has made 33 revolutions from 1783 to 2003, this provides a good linkage between D/1783 W1 and P/2003 A1. Because the period of the comet is not certain, the number of revolutions of the comet could be between 37 and 29. Furthermore, in the case of 33 revolutions, the comet made close approaches to Jupiter: on 1923 9 16.0 to 0.35 AU, on 1864 6 1.5 to 0.57 AU, and on 1852 7 3.0 to 0.98 AU with an approach to 0.67 AU on 1793 4 7.5. The closest approach to the earth during this time was at the appearance of 1783. Rich Kowalski discovered a very diffuse comet during the Catalina Sky Survey with the 0.68m Schmidt on 2009 September 10.4, which was confirmed by several observers including Peter Birtwhistle, following posting on the NEOCP as 9R1E5E6. Dimitry Chestnov linked the object to comet 2003 A1, although the linked orbit had considerably different orbital elements (notably T and q) to those predicted for 2003 A1. Brian Marsden notes on IAUC 9072: "it is meaningless to indicate a Delta(T) value because the prediction is strongly influenced by a very close approach to Jupiter (nominally 0.0605 AU on 2006 Sept. 10.4 TT)." He then computed a linked orbit that satisfactorily included observations of comet Pigott, seen in 1783. The comet was at perihelion in May. Following publication of the new orbit, Maik Meyer was able to locate images of the comet on Siding Spring images taken on 1995 October 29. An object initially reported as asteroidal by the two survey teams was found to show cometary activity by other observers. The object is in a short period orbit of 6.8 years, with perihelion at 1.79 AU in mid November 2003. Jim Scotti recovered P/2004 EW38 with the 1.8-m Spacewatch telescope at Kitt Peak on 2009 September 21.37, noting only stellar appearance. The indicated correction to the orbit prediction on MPC 59600 is Delta(T) = +0.02 day. Following publication of the new orbit, Maik Meyer was able to locate images of the comet on Haleakala-NEAT images taken on 1997 January 15. An object previously reported as asteroidal by LINEAR was shown to have cometary characteristics. It was distant and faint, with a period of 8.5 years and a perihelion distance of 3.4 AU. Jim Scotti recovered P/2001 YX127 with the 1.8-m Spacewatch telescope at Kitt Peak on October 18.45, noting that it was very faintly diffuse with a short tail. The indicated correction to the orbit prediction on MPC 62881 is Delta T = -0.36 day. It reaches perihelion in 2011 August. Alex Gibbs discovered a 19th magnitude comet on September 20.38, during the Catalina Sky Survey with the 0.68m Schmidt. The comet was at perihelion at 2.4 AU in early August and has a period of 7.8 years. Richard Miles used the 2.0-m "Faulkes Telescope North" at Haleakala to provide confirming astrometry and images. When an improved orbit became available, Rob Matson was able to identify images of the comet in NEAT imagery from 2001, and it was given the identifier 2001 Q10 for this return. An apparently asteroidal object of 18th magnitude discovered by LINEAR with the 1.0-m reflector on October 27.43 was found to show a cometary appearance by other astrometrists, The comet was at perihelion at 1.5 AU in early August and has a period of around 6.3 years. Following improved astrometry S. Nakano identified observations of the comet among single-night data from NEAT at the two preceding apparitions in 1997 and 2002, with it being assigned the identifications 1997 A2 and 2002 Q15. Rob Matson independently located the images corresponding to these observations, together with some additional ones and provided measurements. The comet's approach to a distance of 0.88 AU from Jupiter in September 2007 means that the orbital period, currently 6.27 years, was previously 6.48-6.49 years, with the comet's previous two perihelion passages occurring on 2003 Mar. 3 and 1996 Sept. 4. An 18th magnitude comet discovered on NEAT Palomar images obtained on 2003 March 10.36, and posted on the NEO Confirmation Page, was reported by K. Lawrence as showing a nuclear condensation of diameter about 7" and a tail about 8" long toward the west. The cometary nature was confirmed by J. Young at Table Mountain on 2003 March 12.4 UT. The Minor Planet Center linked the object to an apparently asteroidal LINEAR object of mag 19.0 seen on February 1.39 and 4 that was designated 2003 CP_7 (MPS 73383-73384, Feb. 16). [IAUC 8092, 2003 March 12] The comet is a distant one, with period of 8.05 years. The comet was recovered by Gary Hug with his 0.56-m reflector at Sandlot Observatory on 2009 December 11.32. The indicated correction to the prediction on MPC 62880 is Delta(T) = -0.5 day. Rik Hill discovered an 18th magnitude comet on November 18.51 during the Catalina Sky Survey with the 0.68m Schmidt. The comet was at perihelion at 3.0 AU in October and has a period of around 9.5 years. WISE satellite images taken on 2010 February 6 showed that an apparently asteroidal object discovered by the La Sagra Sky Survey on 2009 November 19.88 showed a cometary appearance. Ground based confirming images taken by Spacewatch on February 13 and the McDonald Observatory on February 15 confirm a small faint coma. The comet has a period of 5.3 years and reaches perihelion at 1.8 AU in March. The comet was then identified with asteroid 2005 JR71 by Gareth Williams. An apparently asteroidal object discovered on 2002 February 8.32 by the LINEAR survey, and designated 2002 CF140, was found to show cometary appearance on Mount Lemmon 1.5-m reflector CCD images taken by R. A. Kowalski in poor seeing on March 15. The orbit on MPO 30668 requires a correction of Delta(T) = -0.8 day. The comet has a period of 7.5 years and was last at perihelion in 2009 December, at 2.9 AU. An apparently asteroidal object discovered on 2002 March 16.32 (the IAUC says "last year") by the LINEAR survey, and designated 2002 FA9, was re-discovered by Rob McNaught on CCD images taken with the 0.5-m Uppsala Schmidt telescope on 2010 March 20.61 and noted to show cometary appearance. The orbit on MPO 30730 requires a correction of Delta(T) = -0.8 day. The comet has a period of 8.0 years and was very close to perihelion at 2.7 AU. 2003 UY275 (P/LINEAR) LINEAR discovered an 18th mag asteroid on October 29.32. Subsequent images taken by Carl Hergenrother with the Mt Hopkins 1.2 m reflector on November 30.25 showed cometary features and these were confirmed by other observers. Prediscovery images back to October 5 were also found. It was at perihelion in early July at 1.8 AU and has a period around 7.2 years. It will fade from 18th magnitude. Jim Scotti recovered comet 2003 UY275 on May 20.44 with the Spacewatch 1.8-m f/2.7 reflector at Kitt Peak. The indicated correction to the orbit on MPC 59600 is Delta(T) = -0.70 day. There are suggestions that images taken in late October and early November show that the comet has split into two components. A cometary object discovered by WISE on 2010 June 10.57 was quickly linked by the WISE team to an asteroidal object found by LINEAR on 2002 June 6.23. The comet has a period of 7.2 years and was at perihelion at 2.4 AU in 2009 December. At the 2016 return the comet brightened quite rapidly during the first half of the year and reached 13th magnitude in late June, much brighter than expected. It could continue brightening. Michael Read discovered a 20th mag comet on Spacewatch images taken on 2005 October 24.33. It has a period of 5.6 years, with the comet at perihelion in late July 2005 at 2.4 au. It is classed as a main-belt comet. Jana Pittichova recovered P/2005 U1 on images obtained with the 2.2-m University of Hawaii reflector at Mauna Kea on 2010 July 7.43. The comet was around mag 24. The indicated correction to the prediction on MPC 62880 is Delta(T) = -0.2 day. In 2010 August, images from WISE taken in early February were linked by Gareth Williams to P/1999 XB69 (LINEAR). This then allowed images from the Mt Lemmon Survey taken at the end of 2008 October to be included in the orbital solution. The comet has a period of 9.5 years and was at perihelion in 2009 July. It is a moderately distant and intrinsically faint periodic comet. It has a period of 8.1 years and a perihelion distance of 2.5 AU. R. Huber reported the discovery by LINEAR of an 18th mag comet on 1999 October 30.32. Additional observations were reported following posting on the NEO Confirmation Page [IAUC 7295, 1999 October 31]. It was past perihelion and faded from 16th mag. P/Spahr was discovered by Timothy B Spahr of the University of Arizona on 1998 October 27.4 on CCD images taken with the Catalina Sky Survey 0.41-m f3 Schmidt. It was 17th mag and was confirmed by Spacewatch Telescope images. [IAUC 7042, 1998 October 29]. Gary Hug recovered comet 1998 U4 (P/Spahr) on August 14.41 on images taken with a 0.56-m reflector located near Scranton, KS, U.S.A. The indicated correction to the prediction by B. G. Marsden on MPC 65938 is Delta(T) = +0.04 day. The perihelion distance has migrated out a little to 4.0 AU and the period is now 13.0 years. Ernesto Guido and Giovani Sostero recovered comet 2003 S2 (P/NEAT) on August 15.31 on images taken with a 0.25-m f/3.4 reflector located at the RAS Observatory near Mayhill, NM, U.S.A. The indicated correction to the prediction by B. G. Marsden on MPC 62880 is Delta(T) = -0.33 day. Jim Scotti recovered comet 2000 Y3 (P/Scotti) as an essentially stellar object on images obtained on August 19.38 and 20 with the 0.9-m Spacewatch reflector at Kitt Peak. The indicated correction to the prediction on MPC 65937 is Delta(T) = -0.46 day. A comet was discovered in images from the the Wide-field Infrared Survey Explorer (WISE) satellite on 2010 June 2.50. The comet showed a coma and tail, and was around magnitude 20 when confirmed with ground based images. Richard Miles made confirming observations with the Faulkes Telescope North. The comet was at perihelion at 2.1 AU in February and has a period of 8.1 years. In September 2010 Rob Matson identified the comet on NEAT images from Palomar taken in August and September 2002, and the comet was given the identity 2002 Q16 for this return. On 2004 March 28.54 NEAT discovered a 17th magnitude comet. The observations show that it is in a periodic orbit of 8.1 years and that it passed within 0.37 AU of Jupiter in July 2001, which reduced the perihelion distance. It reached perihelion at 2.86 AU in early January 2005. The NEAT program reports the discovery of a comet on images taken with the 1.2-m reflector at Haleakala, with a tail about 5" long toward the west. Following WWW posting on the NEO Confirmation Page, numerous observers have reported on the object's cometary appearance on CCD images taken during Mar. 28.9-29.4 UT, including F. Hormuth, J. Ticha and M. Tichy, P. Kusnirak, B. L. Stevens, J. Young, and G. Hug -- the object generally showing a coma diameter of 8"-30", total magnitude as bright as 16, and a faint tail approximately 20"-40" long spanning p.a. 240-285 deg. Kazuo Kinoshita calculates that this passage reduced the perihelion distance from 3.8 AU to 2.9 AU. The comet will approach Jupiter again in 2024, when the perihelion will be increased to 3.5 AU. The returns of 2005, 2013 and 2021 are the closest over the last 200 years. The comet should have been bright enough for discovery at earlier returns, which suggests that the change in perihelion distance has enhanced the activity of the comet. The comet was recovered by E. Romas (Rostov-na-Donu, Russia), A. Novichonok (Kondopoga, Russia), and Dmitry Chestnov (Saransk, Russia) on forty stacked 120-s images obtained on November 2.0 UT with the 0.5-m f/8.3 Maksutov-Cassegrain reflector at the Kislovodsk Mountain Astronomical Station of Pulkovo Observatory. Gary Hug (Scranton, KS, U.S.A.) found the comet to be slightly diffuse on images taken with a 0.56-m reflector on November 3.5. The indicated correction to the prediction on MPC 69908 is Delta(T) = -0.02 day. Although not due to reach perihelion until 2013 January, Juan Jose Gonzalez reported it at 12th magnitude on 2012 March 15. 247P/LINEAR = 2002 VP94 = 2010 V3 was discovered by LINEAR on 2002 November 5.31 as an asteroid, of 19th magnitude. It is in an 8.0 year orbit, with perihelion at 1.52 AU and an eccentricity of 0.62. It was at perihelion in 2003 January. [MPEC 2002-V70, 2002 November 15, 10-day orbit] Brian Marsden notes that it is not clear if the object is in fact a comet. The orbit is typical of a Jupiter family comet and it can pass within 0.4 AU of the planet. It was refound by LINEAR on 2010 November 15.39 at 18th magnitude. It was finally confirmed as a comet in 2010 December when observations at the Haute Province Observatory as part of the T2 prject showed that it had a tail. This was confirmed by follow-up observations and announced on MPEC 2010-Y29 on December 27. The comet reaches perihelion in early January at this return, at a distance of 1.48 AU and has a period of 7.9 years. A 19th magnitude object discovered by Alex Gibbs during the Catalina Sky Survey on November 27.19 and confirmed with images from Mt Lemmon in early December was linked to earlier Mt Lemmon observations in late October and early November. The object was then identified by Tim B. Spahr with the following objects that had received minor-planet designations: 1996 TT65; 2010 MS75; 2010 RR59; 2010 RN141; 2010 SQ31; and 2010 TL69. [MPEC 2010-X102, 2010 December 13]. The comet has a period of 14.6 years and will reach perihelion at 2.1 AU in 2011 February. An apparently asteroidal object of 17th magnitude, discovered by LINEAR on 2006 October 19.40 was found to be cometary by other observers. It has the short period of 4.6 years, and was at perihelion at 0.5 AU at the end of 2006 August. Leonid Elenin (Lyubertsy, Russia) recovered 2006 U1 (P/LINEAR) using the ISON-NM Observatory near Mayhill, New Mexico, USA. The indicated correction to the prediction by S. Nakano (2010/2011 Comet Handbook) is Delta(T) = +0.24 day. A 19th magnitude comet was discovered by Steve Larson on Catalina Sky Survey images taken with the 0.68-m Schmidt telescope on January 10.44. Confirming images were taken with the Mt. Lemmon 1.5-m reflector and also following posting on the NEOCP. The comet has a period of 7.3 years and was at perihelion at 2.2 AU in 2010 November. Images of the comet have been found in Spacewatch images from 1995 and 2004 and NEAT images from 2002. Jim Scotti recovered 2004 HC18 (P/LINEAR) using the Spacewatch 1.8m reflector on May 1.47. The indicated correction to the prediction in the 2010/2011 Comet Handbook) is Delta(T) = -0.10 day. It has a 6.5 year period with perihelion at 1.7 AU. F. Shelly, for the Lincoln Near-Earth Asteroid Research project, reported, in connection with the discovery on April 7.45 of a fast-moving 18th mag object, that Lisa Brown-Manguso noticed that the object showed clear cometary activity. [IAUC 7396, 2000 April 8] Subsequent observations confirmed that it was a periodic comet, with a perihelion distance of 1.003 au and perihelion on 2000 March 9.8. The period is 5.4 years. The comet passed only 0.10 au from Earth in late 2000 February and early March, when it could have reached 14th mag, but was at high southern declination. It is intrinsically very faint. Jim Scotti recovered comet 2000 G1 (P/LINEAR) with the Spacewatch telescope on 2011 June 9.42, when it was 23rd magnitude. It was not recovered at its previous return in 2005. The most recent perihelion was in November 2010. The indicated correction to the prediction on MPC 59601 is Delta(T) = -0.24 day. The comet was moved into its present orbit in February 1987 when an encounter to within 0.15 au of Jupiter made significant changes to the elements. It made a close approach to the Earth in 2016, passing 0.036 au from us on March 21, when it was best seen from the Southern Hemisphere. Interestingly, recently discovered 2016 BA14 has a very similar orbit and made an even closer approach a day later. The first observations were made in 2016 February, but it brightened very quickly in March and had reached 6th magnitude by mid month, peaking at 4th magnitude around the time of closest approach. The comet was a large, very diffuse, object. The observations are best fitted by a linear light curve, with the comet at peak output some 39 days after perihelion and brightening unusually rapidly. The rapid brightening gave reports of an outburst, but the degree of condensation has remained low. A standard light curve does not fit the observations. 89 observation received so far suggest a preliminary uncorrected light curve of m = 9.3 + 5 log d + 0.1006 * abs(t-T-39) . The comet could potentially have an associated meteor shower. This would be maximum around March 30 and the meteors would appear to radiate from 5h 08m -16. Pan-STARRS discovered a 19th magnitude comet on September 4.51. It will be at perihelion at 2.0 AU in November and has a period of around 6.2 years. Subsequently S Nakano was able to identify the comet with LINEAR images of asteroid 1998 RS22 and then with 2005 observations by Spacewatch. The comet has a period of 6.5 years. Rob McNaught discovered a diffuse 19th mag comet during the Siding Spring Survey with the 0.5-m Uppsala Schmidt telescope on October 4.57. Following posting on the NEOCP, Brian Marsden identified the object in previous SSS astrometry from September 11.5, and it was confirmed by other observers. The comet reaches perihelion at 3.2 AU in late October and has a period of 10 years. David Levy made a visual discovery of a comet on 2006 October 2.50. Observing near Saturn with his 0.41-m reflector he noted a diffuse object of magnitude 10.5. The cometary nature of the object was confirmed by Peter Birtwhistle and Richard Miles amongst others. The Japanese comet hunter Shigheki Murakami made an independent discovery of the comet on October 4, but by this time the object had been placed on the NEOCP and an IAUC issued. Calculations by Hirohisa Sato suggested a periodic orbit, and an MPEC was issued on October 7 confirming this. The period is 5.2 years, which perhaps suggests that it was discovered in outburst. Several people, including C�dric Bemer, have suggested the possibility of a meteor shower from the comet around December 31/January 1. The orbit is however still a little uncertain, so it is not clear how much meteoric material is likely to be present. At its next return in 2011 the comet makes a close approach to the Earth. Calculations by Andrew Lowe suggest an approach to 0.024 AU, with the comet perhaps visible to the naked eye. If the comet is fragmenting it may be more likely to have a significant dust trail present. The object was at perihelion at 1.0 AU on 2006 October 7. Initial visual and CCD observations suggested that the comet was perhaps a magnitude brighter than the discovery magnitude. Maik Meyer has suggested a possible link with C/1743 C1. The orbit is rather chaotic, but further observations at the 2011 return may help refine the orbit. P/2006 T1 was recovered by the Mt Lemmon Survey on December 17.06 and quickly confirmed by other astrometrists, including Peter Birtwhistle and Richard Miles. At 18th magnitude the comet is much fainter than expected (10 magnitudes) and 2.6 days from the expected perihelion. It was clearly in outburst at discovery in 2006, and there is always a chance that there will be repeat at this return. Unless this happens, or the light curve is unusual it will not get within visual range. An apparently asteroidal object of 18th magntiude found by LINEAR on April 26.26 was found to be cometary by Carl Hergenrother on images taken with the Mount Hobkins 1.2-m telescope on June 24.3. The comet had perihelion at 2.7 AU and a period of 9.9 years. The comet was recovered at Geisei by observers T. Seki, S. Shimomoto and H. Sato on 2012 January 26.5 using the 0.70-m f/7 reflector + CCD. The return to perihelion is 0.17 days later than the prediction on MPC 69909. The current period is 10.0 years. An 18th magnitude comet found during the Catalina Sky Survey on 2005 June 7.32 was linked to an asteroid detected at the Steward Observatory on May 3.37, and with earlier observations by the Catalina Sky Survey on April 17.40. It reached perihelion in late February 2006 at 2.13 AU and has a period of 7.3 years. The comet was recovered by G. Sostero, N. Howes, A. Tripp, E. Guido using the 2.0-m Siding Spring-Faulkes Telescope South on 2012 March 21.60. The comet will reach perihelion 0.01 days later than the prediction on MPC 69910. Pan-STARRS discovered a 22nd magnitude comet on 2012 April 27.43. Images of the comet were then found in Mt Lemmon survey data from February 7 and March 28, and Spacewatch data from March 29. The comet was at perihelion at 3.5 AU in 2011 March and has a period of around 9.2 years. As the orbit became better defined, observations from 2002 were found, confirming the period. Gordon Garradd discovered a 19th magnitude comet on images taken with the 0.5-m Uppsala Schmidt telescope at Siding Spring on 2008 September 2.50. Few observations of the comet were made, but those available suggest a periodic orbit of 4.5 years, with perihelion at 1.8 AU in July. P/2008 R1 (Garradd) is the latest example of a 'Main-Belt Comet' or an 'Activated Asteroid'. Current theory suggests that traditional comets formed between 5 AU and the edge of the proto-solar disk. Most of these proto-comets were absorbed into the rapidly growing outer planets. As the outer planets migrated, the remainder of the proto-comet population was either thrown out of the solar system, thrown into the Oort Cloud, or trapped in the Kuiper Belt / Scattered Disk Population. These populations now give us our usual assortment of comets, the Jupiter-Family Comets, Halley-types and Long-Period Comets. The Main-Belt Comets are volatile-rich bodies that either formed in the asteroid belt or were trapped there during the era of planet migration. One theory, the Nice theory, suggests that all carbonaceous asteroids (C,B,D,F,G type asteroids) in the Main Belt and Jupiter Trojan population originally formed between 5 AU and the outer edge of the Kuiper Belt. This means that objects such as Ceres and Pallas are related to Kuiper Belt Objects and were trapped in stable orbits much closer to the Sun. It is possible that many asteroids in the outer part of the Main Belt are capable of occasional cometary activity. The main point is there may no longer be a clear cut boundary between comets and asteroids. Many objects in the solar system have moved a long way from where they originally formed. Henry Hsieh's research really expanded our knowledge of these objects. He has a good website devoted to his work. Observations by Henry Hsieh in 2012 confirmed observations made in 2010 and 2011 and give a perihelion date in 2013 January, 0.10 days earlier than predicted. With observations made near aphelion it was not given a designation for the 2013 return. Rob McNaught discovered another comet with the 0.5-m Uppsala Schmidt during the Siding Spring Survey on 2005 May 20.79 and was 17th magnitude at discovery. Its period is 7.1 years with perihelion at 1.51 AU in 2005 August. The comet was recovered by M Masek with the 0.3m reflector at the Pierre Auger Observatory, Malargue on 2012 May 15.38 and it will reach perihelion in September, 0.22 days earlier than predicted. It reached a peak near 11th magnitude in 2012 October. 21 visual observations give a preliminary uncorrected light curve of 10.7 + 5 log d +  log r but this is not a good fit, and a linear fit of m = 12.9 + 5 log d + 0.0077 abs(t-T-24) is not much better. Steve Larson discovered a 20th magnitude comet during the course of the Mt Lemon Survey on 2005 July 5.38. It was a short period comet with perihelion at 2.2 AU in 2005 December and a period of 6.8 years. The comet was recovered by Nick Howes, Giovanni Sostero and Ernesto Guido on 2012 May 22.57 using the 2.0-m Faulkes Telescope North when it was 20th magnitude. It reaches perihelion in September, 0.27 days earlier than predicted. Comet 1994 X1 (P/McNaught-Russell) was recovered by Giovanni Sostero, Nick Howes and Ernesto Guido on 2012 May 29.61 using the 2.0-m Faulkes Telescope North. It reaches perihelion in December, 0.02 days earlier than predicted. Although not observed visually at the discovery apparition, its brightness on the Schmidt plates suggests that it might have been within range and the predictions are based on this assumption. These suggested that it might become visible in 2012 July, and would be at its brightest in November and December, when it is well placed in the evening sky. In the event it wasn't seen visually until early November, when it was 13th magnitude. A month later it had brightened further to 11th magnitude. This change suggests that it may be a comet that shows a linear brightening, so could brighten further. Alex Gibbs discovered an 18th magnitude comet on 2006 December 26.49 during the course of the Catalina Sky Survey with the 0.68-m Schmidt. The comet was near perihelion at 1.3 AU, and has a period of 5.3 years. H Sato recovered 2006 Y2 on May 16.14, though confirmatory images were not taken until June, when the recovery was announced. The comet was near perihelion at 1.3 AU at recovery. Jim Larsen discovered a 19th magnitude comet in Spacewatch images of 2004 April 22.33. It has an elliptical orbit, with period of 7.7 years and was at perihelion in mid March 2004 at 2.4 AU. K Sarneczky recovered 2004 H3 on June 15.92 with the University of Szeged 0.60-m Schmidt at Piszekesteto Station (Konkoly), when the comet was some seven months past perihelion. The comet has a period of 7.7 years, and returned to perihelion 1.29 days earlier than predicted. A 19th magnitude comet was discovered by LINEAR on 2003 July 29.38, although other CCD observers estimated it at 17th magnitude. It reached perihelion at 1.5 AU in early September and had a period of 8.8 years. Peter Birtwistle imaged it on July 31.04. It showed a surprisingly long tail, perhaps suggesting a recent outburst. H Sato recovered 2003 O2 on June 18.43 using the 0.51-m f/6.8 astrograph at the RAS Observatory, Mayhill. The comet was near perihelion and now has a period of 8.7 years. Eric Christensen discovered an 18th magnitude comet on 2006 October 27.39 during the course of the Catalina Sky Survey with the 0.68-m Schmidt telescope. The comet had a period of 6.6 years, with perihelion at 2.3 AU in mid 2007 January. Recovery mages were taken at Majdanak on 2012 August 15 by O. Burhonov with the 1.5m Ritchey-Chretien, with confirmation images taken on August 28, and measured by Artyom Novichonok. The comet will reach perihelion 0.21 days early compared to predictions on the MPC. A 19th magnitude asteroid was discovered by LONEOS on 2006 August 29.27 and when posted on the NEOCP was found to show a coma and tail by Peter Birtwhistle and others. The object was at perihelion at 1.3 AU in early September 2006 and had a period of 6.0 years. It was near its brightest and faded after mid September. The comet was recovered by V. Nevski, D. Ivanov, A. Novichonok and I. Kondratenko on images taken on 2012 September 11.9 with the 0.4m reflector at the ISON-Kislovodsk Observatory. Additional images were taken by Robert Holmes on September 12.3 with the 0.61m astrograph at the Astronomical Research Observatory, Westfield. The comet reached perihelion 0.8 days late in 2012 August compared to predictions on the MPC. Fabrizio Bernardi discovered a 20th magnitude comet on CFH telescope images taken on 2005 November 1.62. It had a period of 9.5 years, with perihelion at 2.3 AU in mid August 2005. David Tholen's team recovered the comet with the 8.2m reflector at Mauna Kea on 2012 August 13.55, when it was 24th magnitude. It doesn't return to perihelion until 2015. 1996 A1 (P/Jedicke) was discovered on 1996 January 14.26 by Victoria and Robert Jedicke with the Spacewatch telescope at Kitt Peak. It was 17th magnitude with a short tail. The comet was recovered on images taken on 2012 September 11.86 by O Burhonov with the 1.5m Ritchey-Chretien at the Majdanak Observatory and measured by Artyom Novichonok. Additional observations were made at the Steward Observatory, Kitt Peak, later in the month, and the recovery allowed identification of further pre-discovery images taken at the Observatory in 1993 October. The comet will reach perihelion 0.74 days early in 2014 November compared to predictions on the MPC, and has a period of 19.8 years. Tom Gehrels discovered this comet by eye during the course of the Spacewatch survey. The comet was recovered on images taken on 2012 September 25.38 by the Mt Lemmon Survey with the 1.5-m reflector. The comet will reach perihelion 1.74 days later in 2013 July compared to predictions on the MPC. An asteroidal object of 21st magnitude found during the Mt Lemmon Survey with the 1.5m reflector on September 17.35, was later seen to have cometary features. Immediately following publication of the MPEC announcing the discovery, Maik Meyer suggested an identity with P/van Houten (1960 S1), and Gareth Williams then computed a linked orbit. The comet is at perihelion at 4.2 AU in 2013 July and has a period of 18 years. Jovian perturbations have increased the period from 15.8 years in 1960, and increased the perihelion distance from 3.9 AU. The comet was only observed for a month in 1961 and the date of perihelion was 6 days out, and the period 70 days too short. The Near-Earth Asteroid Tracking project discovered a faint comet on 2004 March 18.31 on CCD images taken with the 1.2-m Palomar Schmidt telescope. Prediscovery observations were found back to 2003 December 1 and these showed that the comet was in a 9.5 year periodic orbit, with perihelion in mid October 2003 at 2.45 AU. 2004 F1 (P/NEAT) was recovered on images taken on 2012 November 12.49 by the Mt Lemmon Survey with the 1.5-m reflector. The comet will reach perihelion 1.0 days earlier in 2013 February compared to predictions on the MPC. Rob Matson discovered a comet in SWAN images taken on November 7, 10, 11, 13 and 19 on November 29, and this was quickly confirmed in ground based images taken by Terry Lovejoy on November 29.40. The comet is around 10.5 in his images. Maik Meyer and independently, Gareth Williams, suggested an identity with D/Pons-Gambart (1827 M1), which itself was linked to a comet seen in 1110 in China and Korea. At the 1827 return the comet had an absolute magnitude of 7, whereas the preliminary estimate for the current return is 9.5. A possible explanation, first suggested by Jakob Cerny, is that the comet has a linear light-curve and is brightest after perihelion. The comet reached perihelion at 0.81 AU on December 19 and is in a retrograde orbit with a period of 188 years. Despite the computation of an orbit based on the SWAN data, the name SWAN has not been incorporated into the comet name. These orbital elements, like those on MPEC X02, assume that C/2012 V4 is a return of D/1827 M1 (Pons-Gambart). Whereas that earlier orbit assumed that there were two missed returns between 1827 and 2012, the above orbit assumes no missed returns. The much longer period was suggested by the current observations not being well fit to orbital periods of ~62 and ~94 years. Noting the obvious discordance between the two E27 observations on Nov. 29, the semi-major axis fit by the 2012 observations alone is at least 26 AU, discounting the two- and three-missed revolution solutions. At the present time, the solution presented here is believed to be correct, as the fit of the bulk of the 1827 observations (known to be grossly inaccurate by modern standards) is far better than earlier attempts with shorter orbital periods. There is a slight systematic trend in the current residuals, which may be related to observation weighting. Continued observation is clearly desirable. The latest orbit by Hirohisa Sato, based only on the 2012 observations, gives a period of 196 years, ie the last perihelion was in 1819. Forcing a fit to 1827 M1 increases the residuals of the modern observations. This could imply that there are significant non-gravitational forces acting, or that possibly the comet split at some point in the past and this is not a return of the comet seen in 1827. This might explain the apparent discrepancy in absolute magnitude. Richard Miles demonstrated that CCD imagers can image comets in conditions that defeat visual observers with images taken from the UK on December 5, when the comet was very low in the sky. The comet emerged from conjunction towards the end of January as a 9th magnitude object, a little brighter than expected, but in line with suggestions of a linear light curve, with the comet brightest about 22 days after perihelion. More observations are required. An asteroid was discovered at the Tenagra II observatory by Michael Schwartz and Paulo Holvorcem with the 0.41m astrograph on November 27.50. On December 3 they noted cometary features during follow-up observations and these were confirmed by other observers. Syuichi Nakano then linked the comet to asteroid 2003 WZ141 which was observed by Spacewatch and LINEAR in 2003, and to a comet discovered by Clyde Tombaugh in 1932 on plates taken in 1931 January and which was originally logged as asteroid 1931 AN. Details of the chain of events surrounding 1931 AN are given by Gary Kronk in Volume 3 of Cometography. Gareth Williams then computed an orbit linking the three apparitions. The new orbit is very different to that calculated for 1931 AN, largely on account of large errors in the position from the first of its three plates. The new orbit has the 1931 perihelion at 2.4 AU cf the 0.9 AU calculated from four positions, and is periodic rather than parabolic. The current period is 9.1 years, and this is the 10th return, reaching perihelion in 2013 February. It seems likely that the comet may have outburst in 1931, as it was estimated at 12th magnitude on the plates, some 6 magnitudes brighter than suggested by the ephemeris. Alternatively it may have a linear type light curve. S M Hermann of the LONEOS team discovered a comet on images taken on February 20.4 [IAUC 7111, 1999 February 20]. It is an intrinsically faint short period comet and was predicted to return on 2012 December 18.4. Pan-STARRS discovered a 20th magnitude comet on December 22.61. Following posting on the NEOCP and confirmation by T. Linder and R. Holmes at Cerro Tololo with the 0.41-m f/11 Ritchey-Chretien, Gareth Williams and Maik Meyer linked it to 1999 D1 (P/Hermann). The comet reaches perihelion at 1.6 AU on December 27.3 and has a period of around 14 years. Tomas Vorobjov discovered a 20th magnitude comet on October 15.37 on CCD images taken with the 0.81m f/7 Ritchey-Chretien at the Mount Lemmon SkyCenter. The comet is at perihelion at 3.9 AU in 2013 January and has a period of 12.5 years. As the orbit improved, pre-discovery images taken by the Mt Lemmon Survey in 2011 November were found. Rob Matson then found and measured images taken by NEAT in 2000 December and 2001 January. LINEAR discovered an asteroid of 18th magnitude on December 28, which had an orbit typical of Jupiter family comets. [MPEC 2006-A07, 2006 January 2, 5-day orbit]. It can approach within 0.3 AU of Jupiter, although the closest approach in the period 1900 - 2100 is 0.92 AU. As an asteroid it was estimated to be around 6km in diameter. It has underone occasional minor perturbing encounters with Jupiter, most recently in 1996. Further observations showed cometary characteristics. Perihelion was at 1.9 AU in early November 2005, and it has a period of 7.6 years. Rob McNaught discovered another comet during the course of the Siding Spring Survey on 2006 May 22.16. The object was 18th magnitude and near opposition. It reached perihelion at 2.1 AU in late June 2006 and has a period of 7.1 years. It has undergone occasional minor perturbing encounters with Jupiter, most recently in 1989. An apparently asteroidal object of 18th magnitude discovered on CCD images taken remotely in the course of the "La Sagra Sky Survey" (LSSS), with a 0.45-m f/2.8 reflector located at Sagra mountain in southeastern Spain, was found to show cometary appearance by CCD astrometrists elsewhere. The observation on 2009 August 19.05 was assigned "discovery" status after the Minor Planet Center linked "one-night" LSSS observations made on August 19 with others made on August 25 (though earlier LSSS observations were made on August 16), and later LSSS and Catalina observations linked by the MPC allowed the issuance a comet-like orbit on September 8, in the daily aggregate of new orbits (MPEC 2009-R26). [IAUC 9078, 2009 September 29] The comet was at perihelion in mid October at 2.1 AU and has a period of 6.8 years. Exactly one year ago fellow asteroid hunter Patrick Wiggins posted on MPML his joy about his latest asteroid discovery. You can find the thread in the MPML archive (subject: "It's still possible"). His conclusion was that it is still possible for amateurs to find "bright" asteroids, despite the huge sky coverage by the NASA NEO surveys. In an attempt to underline this and to motivate other fellow observers I had then posted some experiences made in the first few months of our own sky survey. After just three months of permanently scanning the skies we had received around one thousand designations from MPC and the sky seemed to be full of unidentified asteroids, some of them as bright as magnitude 17. Now, exactly one year later, the situation has not changed significantly. At J75 we keep scanning with the 45-cm and we find lots of new stuff ranging from magnitude 18 to 20. Sometimes as many as a few hundred possibly new objects per night. It shows that finding new asteroids is not a matter of luck, just a function of search area and limiting magnitude... and more or less the same applies to comets I guess. We have missed a few of them in the past, either because they were just outside the search area. Or because of some other "constraints" (see below). Now we finally scored one and this one would have gone unnoticed too if MPC wouldn't have linked it to other survey observations so that it showed a cometary orbit and drew special attention therefore. Finding one is way more difficult than finding an asteroid, even a NEO. But I guess it comes too more or less guaranteed after a lot of searching, like with asteroids. Definitely the times are much harder now compared to the age when Dennis di Cicco wrote his famous "Hunting Asteroids From Your Backyard" article 15 years ago. At that time nearly every mover on the sky was a new one, even at magnitude 16. The big surveys are now in operation since more than 10 years and the number of objects that have been discovered and have received orbits has virtually exploded, from around 29,000 in early January 1996 to more than 460,000 objects now (out of these were 6,800 numbered then vs. 220,000 numbered objects now). I am therefore not able to tell how many hours it took us to score the first one, but here are a few numbers that might help evaluate how much "asteroid work" was done (=sky was scanned) until the first new comet showed up. They are from more or less one year of LSSS operations. Earlier this month I did extract some numbers for J75 LSSS from the MPC observations database and I noticed that we had meanwhile published more than 500,000 observations for a total of 75,000 individual objects. Thirty percent of all numbered asteroids to date were observed by J75. And the number of designations received from the MPC is now at 3300. And still, compared to the numbers delivered by Catalina, LINEAR and Spacewatch ours are rather humble. We know that we can't compete with them and it isn't our goal at all. LSSS is working different than the big surveys. It is an amateur survey done entirely remotely. Only one operator is permanently at the observatory, while all others are up to several thousand kilometers away. As all of us have day jobs, it is only possible to run this survey by using every free minute, being connected remotely no matter where we currently are. "There's a lot of stuff out there waiting to be discovered, and it doesn't take long to find it!" In early 2013 Rob Matson found the comet in NEAT images taken with the Palomar 1.2m Schmidt in 2002 July, and other images were found in frames from the Apache Point 2.5m telescope. Jim Larsen discovered a 20th magnitude comet in Spacewatch images of 2004 April 19.41. The comet is in a 9.6 year elliptical orbit and was at perihelion in mid May at 2.62 AU. Claudine Rinner at the Morocco Oukaimeden Sky Survey (MOSS) discovered an object on February 5.11, that was initially flagged as an asteroid. Pre-discovery images were found in Spacewatch data from January. Cometary features were found. It reached perihelion at 4.0 au in 2012 May and has a period of around 11 years. With further astrometry leading to an improved orbit, Maik Meyer found and measured the comet in NEAT images from February and March 2002, and the comet was also found in Spacewatch images from 2000 November. Pan-STARRS discovered a 21st magnitude comet on 2012 October 6.53. Confirmation was made by astrometrists from the T3 group. Archival observations from Pan-STARRS were found from 2011 July. The comet was designated as 2012 T1. It was at perihelion at 2.4 AU in 2012 September and has a period of around 5.6 years. It is a Main Belt Comet, with a stable orbit for the period 1900 - 2100. On 2013 January 26 Rob Matson found images of a comet in frames taken by NEAT with the Palomar 1.2m Schmidt on 2001 December 9. This was linked to 2003 BM80, which had been discovered by LONEOS on 2003 January 31 at the Anderson Mesa station, and to the PanSTARRS comet allowing it to be numbered as 282P. Although the comet was numbered, the MPC list as recently as 2017 July 10 did not give it a name. 2012 T1 was recovered on 2017 July 1.37 with the Gemini South 8.1m reflector. This time it was given the PanSTARRS name and the designation 2017 O3, though not linked to the previously numbered comet. [MPEC 2017-Q115, 2017 August 25] It seems that the original linkage was incorrect and so the PanSTARRS comet was then renumbered as 358P folowing this recovery. The linked orbit for 358P does include the NEAT observations from 2001. A 19th magnitude asteroid was discovered by Spacewatch on March 2.28 with the 0.9m reflector. Cometary characteristics were noted in images taken by Hidetaka Sato in 2013 April using the remote 0.51m telescope at the iTelescope Observatory at Siding Spring, and confirmed by other observers, and earlier observations were found from 2013 February. The comet was at perihelion at 2.1 au in 2013 April and has a period of around 8 years. [MPEC 2013-J07, 2013 May 2] Andrew Lowe quickly reported that he found astrometry from 1996 and 2005 and that the comet had made a number of approaches to within 0.5 au of Jupiter between 1600 and 2400. Rob McNaught discovered a 16th magnitude comet on images taken for the Siding Spring Survey with the 0.5-m Uppsala Schmidt on 2007 April 17.79. It was confirmed by several amateur CCD observers. Further observations showed that it has a period of 7.0 years. The comet has perihelion at 2.3 AU and a period of 7.0 years. It reached 13th magnitude at this return. Jim Scotti recovered 2007 H1 with the Spacewatch 1.8m reflector on May 1.41. The comet will return 0.22 days earlier than predicted in 2014 September, when it may again reach 13th magnitude. LINEAR discovered an 18th mag comet on October 19.09 which was confirmed to be cometary by other observers. Prediscovery images back to September 19 were also found. It was at perihelion in early December 2003 at 1.7 au and has a period of 9.6 years. The comet is one of those suspected to have undergone nuclear splitting according to the list of Marcos & Marcos [Dynamically correlated minor bodies in the outer solar system, MNRAS, 474, 838, 2018 February]. They link it to 2013 N5 (P/PanSTARRS). Eric Christensen discovered an 18th magnitude comet in the course of the Mt Lemon survey on 2005 June 13.35. It is in a periodic orbit of 8.3 years with perihelion at 2.37 AU. Eric Christensen discovered a 17th magnitude comet on 2006 September 14.32 during the course of the Catalina Sky Survey with the 0.68-m Schmidt telescope. It was at perihelion at 3.0 AU in mid June and has a period of 8.5 years. This main belt asteroid, discovered by Spacewatch on 2006 November 15, was shown to have cometary features in PanSTARRS images taken in 2011 November. It was at perihelion in 2011 July and has a period of 5.3 years, with a perihelion distance of 2.4 au. It has been observed at returns in 2000, 2006 and 2011, and at six oppositions and was therefore given a periodic comet number. More on Main Belt Comets from the IFA in Hawaii. The latest MPC orbits leave it numbered but un-named. Activity had ceased by 2012. Hubble Space Telescope images from 2016 September showed that the object is a binary, which may have broken apart around 5000 years ago due to fast rotation. The two comets orbit each other at a separation of around 100 km, and one component may rotate with a period of about 16 hours. The comet is a member of a family of at least 11 objects that were created in a collision of a ten kilometre progenitor around 7.5 million years ago. An object initially identified as an asteroid, of 18th magnitude, was discovered by the Catalina Sky Survey on 2003 November 22.15. It is in a 5.3 year orbit, with perihelion at 1.00 AU and an eccentricity of 0.67. It reached perihelion in mid December 2003. [MPEC 2003-W41, 2003 November 22, 28-day orbit] The orbit is typical of a Jupiter family comet, and it can approach Jupiter to within 0.2 AU, approaching it to 0.4 AU in 1995. It is also a PHA, approaching earth to 0.005 AU at the ascending node. It approached the Earth to 0.025 AU in mid December, when it reached 15th mag. At discovery the comet was around 6.5, with a coma of 6 - 7 ' diameter. It was observed for 59 days. Although Vsekhsvyatskij gives an absolute magnitude of 8.5, this doesn't fit the ephemeris very well and 10.5 is more likely. The comet was recovered by PanSTARRS on July 4.46, when it was found in outburst at 20th magnitude, some five magnitudes brighter than expected. [MPEC 2013-N20, 2013 July 6]. A new linked orbit was published in MPEC 2013-N21 [2013 July 7] and it was then numbered. Although expected to be renamed Blanpain-Catalina, it has reverted to just 289P/Blanpain. Michael Jager discovered a comet on 16- and 9-min Technical Pan film exposures with a 0.25-m f/2.8 Schmidt camera. The comet had a 1'-2' coma with condensation and a tail several arcmin long in p.a. 275-281 deg and is around 12th mag. [IAUC 7038, 1998 October 25]. It was at perihelion in early December 1998. Jonathan Shanklin observed it on 1998 October 29.1, making it around 12.5 in the Northumberland refractor x105, DC s3 and diameter around 1'. Nick James imaged the comet on October 26. Observations with the Northumberland in 1999 March put the comet at 12 - 13th magnitude. Observing on 1999 April 9/10 Shanklin could barely see the comet in the Northumberland, estimating it 13.6. Weidong Li, Department of Astronomy, University of California at Berkeley, reported his discovery of a comet in the course of the Lick Observatory Supernova Search (cf. IAUC 6627; with the participation of M. Papenkova, E. Halderson, M. Modjaz, T. Shefler, J. Y. King, R. R. Treffers and A. V. Filippenko). The object was found automatically by the Katzman Automatic Imaging Telescope in the field of NGC 1041, but it was immediately recognized as a comet by Li, who then used the equipment to make a deliberate confirmatory observation, as well as follow-up observations on the following night. [IAUC 7075, 1998 December 28]. The comet is periodic with a period of about 15.2 years. Hidetaka Sato imaged comet 1998 Y2 (P/Li) on 2013 May 9.80 with the 0.51m astrograph of the iTelescope at Siding Spring, but confirmation of the recovery was not made until 2013 July 16.39 when it was imaged by M Masek with the 0.3m reflector at the Pierre Auger Observatory, Malargue. [MPEC 2013-O52, 2013 July 27] Perihelion is 0.85 days later than predicted. Carl Hergenrother detected cometary activity in the asteroid 2006 XG16, which was discovered by Spacewatch on 2006 December 10.41. Images taken with the 1.54-m Catalina telescope on 2007 January 27 and 28 showed a coma and tail on the 18th magnitude object. It was then near perihelion and has a period of 6.9 years. Jim Scotti recovered 2006 XG16 with the 1.8-m Spacewatch II reflector on September 14.48 when it was 22nd magnitude. [MPEC 2013-S01, 2013 September 16] Perihelion is 0.07 days later than predicted. An apparently asteroidal object of 20th magnitude discovered by LINEAR on 2008 January 13.22 was found to show a coma after posting on the NEOCP. The comet has a period of about 5.7 years and perihelion was at 1.3 AU in 2008 June. An asteroid discovered by LINEAR on 2002 January 6.15 was found to be a comet, initially suggested by its orbit, with follow up observations showing a coma. The object is in a 12.5 year orbit, with perihelion at 2.0 AU in mid January. It was 18th magnitude. Jim Scotti recovered 2002 AR2 with the 0.9m Spacewatch telescope at Kitt Peak on September 14.2, and it was also imaged by the Mount Lemmon Survey during September and October, but it wasn't finally confirmed until Scotti imaged it with the 1.8-m Spacewatch II reflector on December 25.15 when it was 21st magnitude. [MPEC 2013-Y30, 2013 December 25] The comet returns to perihelion 0.7 days earlier than predicted. Gordon Garradd discovered a 17th magnitude comet on images taken for the Siding Spring Survey with the 0.5-m Uppsala Schmidt on 2007 April 22.51. It was confirmed by N. Teamo and Sebastian Hoenig using a 0.41-m f/8 reflector at Punaauia, Tahiti. Prediscovery images from March were found in Siding Spring observations. The comet reached perihelion at 1.8 AU in mid August, and has a period of 6.5 years. The comet was recovered by an observing team at the Pierre Auger Observatory, Malargue using the 0.3m f/10 reflector on January 6.31. Following recovery prediscovery NEAT images from 2001 June were identified. The comet was close to the predicted time of return. Ed Beshore discovered a 14th magnitude comet with the Mt Lemmon 1.5-m reflector on 2008 May 6.47. It was confirmed by many other CCD observers. Orbit computation by Hirohisa Sato suggested that the orbit was of short period. The comet was at perihelion at 2.41 AU in late March 2008 and has a period of 6.5 years. It is a member of the "Main Belt Comet" family. Eric Christensen discovered a 19th magnitude comet with the 0.68-m Schmidt during the Catalina Sky Survey on February 9.28. Following posting on the NEOCP it was confirmed by Giovanni Sostero and E Guido. The orbit given on the discovery IAUC & MPEC was parabolic, although a suggestion was given that it might be elliptical. Further observations and a calculation by Hirohisa Sato showed that it did have an elliptical orbit. The comet has a period of 6.5 years, with perihelion at 2.1 au in early March.